Burns can be a nasty business. I have had and seen my fair share of them, from hot soup spilled on my chest at age 10, resulting in a large 2nd degree burn, to seeing hot steam burns on someone’s face. One of the difficult things with burns is the pain, which does not go away quickly. I have heard of cases of using hot water to kill the pain of a burn, but have always been reluctant to try it as it seems that even if it works, it is merely tricking the nerves and not helping the injury to heal. However, Chinese medicine has a very effective answer for burns: Ching Wan Hung Burn Ointment. 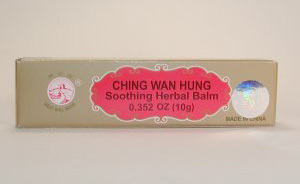 Ching Wan Hung Ointment comes in small tubes or larger tubes and costs a few dollars. I have seen it heal a wide variety of severe second degree burns in an amazingly short time. I did not have it handy when I was 10, but years later when I put my hand down on an electric stove top and burned ring shaped blisters into my palm, it not only killed the pain in less than five minutes, the ointment also healed the burn incredibly fast. Two days later, when the blisters broke, new pink skin was already coming up underneath. Since then I have seen it work with a wide variety of burns, including steam burns on the face. I have also seen it work with small 3rd degree burns. Ching Wan Hung Ointment stops pain, cools heat, decreases inflammation, and promotes the regeneration of damaged tissues due to burns. It can be used to treat any kind of burn on the body surface, including burns caused by steam, hot water, flame, hot oil, chemical burns, sunburn and electrical burns. Use it topically for first, second and third degree burns with blistering, redness and pain. For first or second degree burns, first clean the area, then rub the ointment directly on the surface area of the burn and cover it loosely with a band-aid or bandage. For a severe second degree burn, apply a think layer of the ointment and then cover it with a light and loose gauze bandage. Change the ointment and gauze twice a day. For third degree burns with infection, the wound should be cleaned every day and larger amounts of the ointment should be used. Make sure to keep the wound covered, but not tightly. The area must be able to breathe. The ingredients of the ointment are not listed, however, they include Chinese medicinal herbs that clear heat and detoxify fire poison (prevent infection and fight infection, if present); clear blood heat; dry dampness (eliminate pus); decrease swelling; stop pain and speed healing and regeneration of damaged tissues due to burns. After applying this ointment, the pain is usually stopped immediately or within minutes. Ching Wan Hung Ointment can be used to treat other disorders and skin conditions characterized by heat and tissue damage, such as hemorrhoids, bedsores, pediatric eczema, poison oak, poison ivy, dermatitis, and ulcerative rashes. Many of my friends have told me that it also works remarkably well for diaper rash. If you have small children it is a must-have for the household in case of burns, because it kills pain quickly and rapidly promotes the growth of new skin. Ching Wan Hung Ointment is for EXTERNAL USE ONLY. This product can discolor clothes. Do not apply topically to lower abdomen or lumbar spine during pregnancy. Wash hands thoroughly after each use. Discontinue use if skin irritation develops. Do not apply to open cuts, sensitive areas, or genital areas.